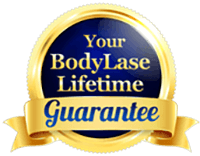 Diamond Status is achieved by being one of the nation’s top providers of Allergan products, including BOTOX® Cosmetic, LATISSE®, SkinMedica®, KYBELLA® and JUVÉDERM®. We are also in the top 2% of BOTOX® providers in the nation! 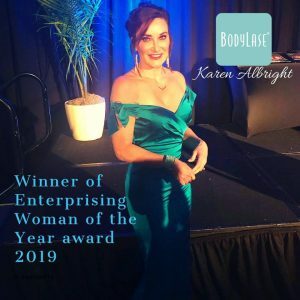 Karen was named a winner in the Enterprising Women of the Year Awards, which recognizes the world’s top women entrepreneurs, and is widely considered one of the most prestigious recognition programs for women business owners. To win, nominees must demonstrate that they have fast-growth businesses, mentor or actively support other women and girls involved in entrepreneurship, and stand out as leaders in their communities. Many of the honorees also serve as leaders of the key organizations that support the growth of women’s entrepreneurship. Karen Albright, president, was named a 2011 Women Extraordinaire recipient, the Business Leader Magazine and 2010 Women Extraordinaire recipient. The Women Extraordinaire Awards are among the Triangle’s most prestigious accolades honoring area businesswomen. Those selected as Women Extraordinaire are recognized for being leaders, innovators, problem solvers and inspirations to other women. These women serve the community by making a difference for worthy causes or by providing leadership, direction or support to service-based professional, civic or charitable organizations. Karen Albright, president, received the 2010 Woman Business Owner of the Year by the Greater Raleigh chapter of the National Association of Women Business Owners. The award recognizes the accomplishments of an outstanding NAWBO member who has used creative initiatives to overcome obstacles, create jobs, grow a successful business and help her community. The award was presented to Karen at the 32nd Annual Installation and Awards. Karen Albright, president, received the 2009 Triangle Business Journal’s Women in Business award which honors the Triangle’s most influential and highly accomplished female leaders across several categories, including Community Supporter, Corporate Executive, Entrepreneur, Innovation, Inspiration, Mentor, and Nonprofit Leadership. 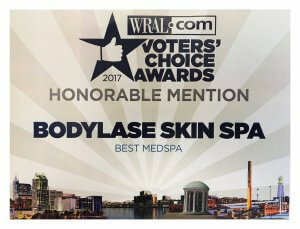 The spa received a Standing Ovation MetroBravo award for best skin care products. The MetroBravo Awards, presented annually by Metro Magazine, showcase the best businesses in the Triangle, which are nominated and voted on by the magazine’s readers.